A rebranded P3 Retail Program! As the ICSC Eastern Division Co-Chair for the now rebranded P3 Retail Program (P3 stands for “Public Private Partnerships”), it was a thrill to see the launch in action. The ICSC team, including Cynthia Stewart, Michael Cowden and Jazmen Johnson had videographers ready to go. They had some of their members conduct interviews with ICSC members about their experiences and insight. I’ll be very excited to see the final results when it is all done. I was interviewed, and also had the chance to interview Keith Sellars of the Washington D.C. Economic Partnership as well as Mary Reda and Jim Diego of Greater Jamaica Development Corporation. I really enjoyed hearing their insights and learning from their experiences. Prep work is what it takes to have a great outcome. This year, we we thrilled to work closely on ICSC prep for a large community development corporation here in one of New York’s largest outer Borough downtown districts. While the team has been attending ICSC for over five years, they were looking to refocus and refine their efforts and asked us to help. We began by defining their merchandising strategy based on consumer market data and existing business mix. 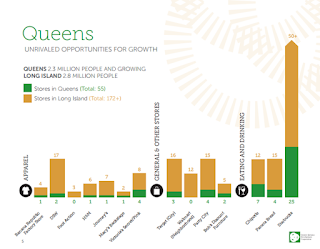 We used this data-driven approach to identify “like districts” that shared similar demographics and retailers. We then combed those districts to identify retailers who were already located in similar markets and with similar co-tenants, but not yet in the district. We also had to make sure that these prospects could be accommodated in available spaces within the district, based an opportunity site list we developed with the client, and that they were the right price points and “lifestyle” fit for the area. 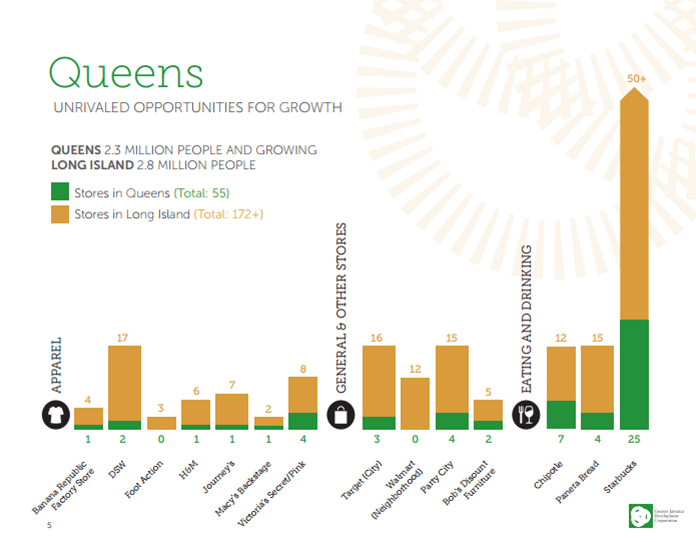 Finally, we did research into whether those prospects were growing in the region. Once we drilled down on prospects that made the final cut, we worked with our client to identify contacts for each – that included who they already knew, who we knew through our industry relationships, and who we could find through our access to the ICSC database and Deal Making attendance list. Once that happened, the client was ready to make calls and set up appointments at the show. Getting a booth or kiosk can make a difference. This year ICSC made a concerted effort to enlist more non-profit and public municipalities with a discount entry option. I was proud to have been a part of that as Chair of the Municipalities subcommittee that helped plan this part of the show. Our client had never taken a kiosk before and this year they did, and I am happy to say that they raved about the experience. Being able to have a home base, conduct meetings in the shared P3 Pavilion retail space, and chat with drop ins made a real difference for them, and they plan to do it again next year. It is important to note that they made sure to man the booth at all times – and also had staff walking around attending meetings. Another thing to keep in mind is that this strategy needs to be part of a comprehensive approach to the show. Don’t think that you can get a booth and people will automatically come to you. The location of the P3 pavilion at the New York show was pretty good. In Vegas however, the Cities of the World pavilion, as it is branded, is in a much more out of the way location. Some cities and non-profit orgs decide to take booths closer to the action, but at greater expense. Everything is a trade off. On that note I enjoyed my conversation with Keith Sellers of the Washington DC Economic Partnership. 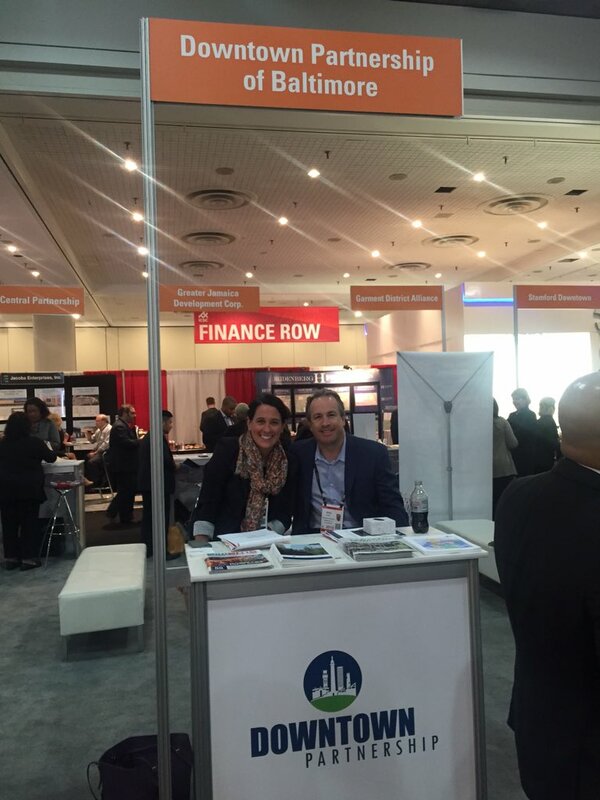 They have been attending ICSC for over a decade, and graduated from a shared booth with a utility company to a 5,000+ sf booth in underwritten in part by the local developers. Their approach is so incredibly strategic and thoughtful, and I enjoyed hearing Keith talk about how far they had come. Social media DURING the show is important. 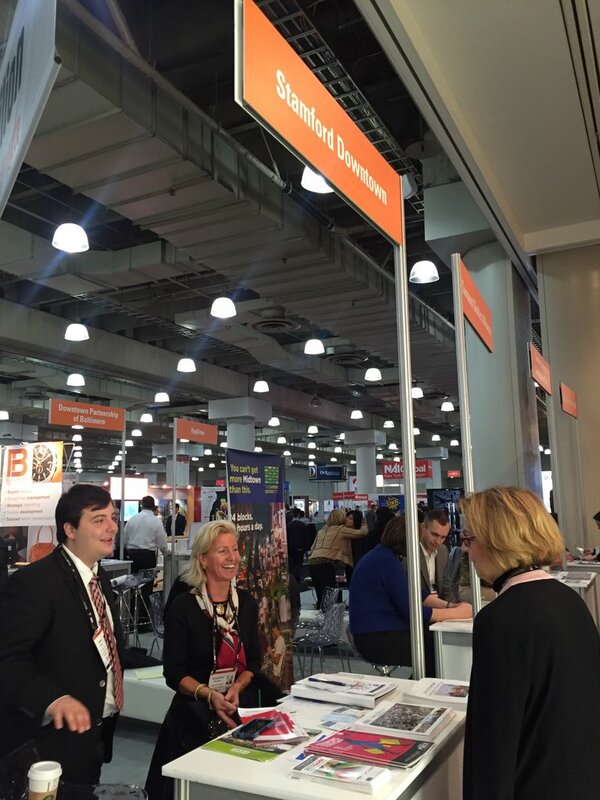 You have to treat your booth or kiosk as a might a retail store. If you don’t market it, you are missing opportunities to connect with potential customers. Same goes for a trade show. The good news is that ICSC helps with this. 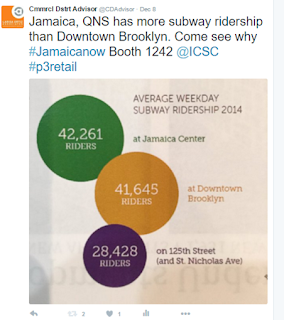 They had a hashtag (#NYnDM) and twitter handle (@ICSC) and would retweet things that were tweeted their way. We made sure to utilize this marketing support and it was a great way to drive traffic to the P3 pavilion and to individual booths. A marketing brochure may not be the right approach for your district. To support our client’s outreach, part of our task included developing new marketing material for them. In the past, their typical marketing strategy was a multi-page brochure with lots of words and tables of data. We knew from our work in the industry that marketing strategies are changing quickly, and that the multi-page brochure, while still making the rounds, can be hard to share digitally and doesn’t always come across the same way when viewed on a computer. So we made a suggestion to do something a little different but much more in line with where the industry is going when it comes to marketing retail and site opportunities. Increasingly, developers and brokers are creating marketing decks – basically short slide shows that can be printed and distributed, but are more likely to be viewed and distributed digitally. They rely less on verbage (that very few read anyway) and more on great info graphics to make a case. They are more straightforward to understand, can be used to tell a story, easier to refine, and easier mix and match on demand. Our client carried these around in bound booklets for reference, and then told the contacts they made that they would forward them the material after the conference. This strategy is a great way to continue contact and an excuse to follow up afterwards – which is the key to success. What I also found was that the decks were a good aide in keeping the presenter on message. And after the pitch, but during the meeting, they were easier to use. You could quickly go back to any slide that communicates the point you want to reinforce. 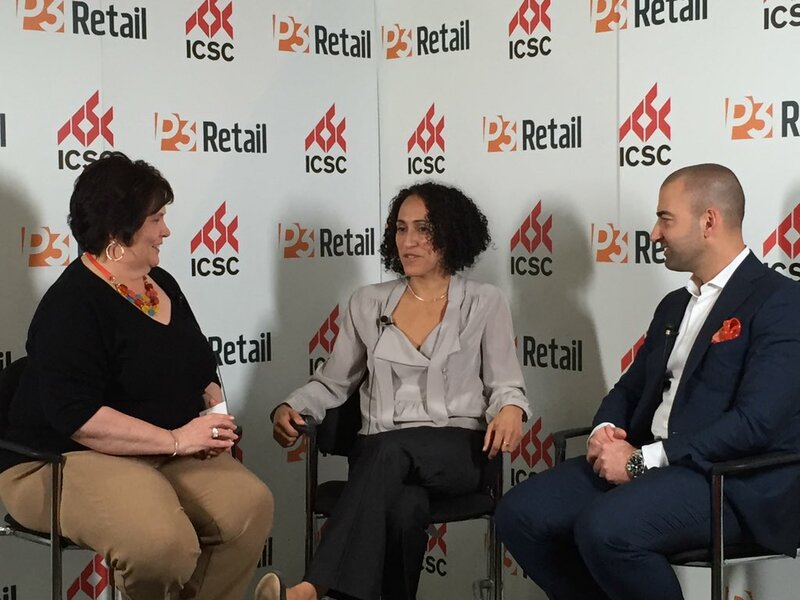 Overall I was so happy with the outcomes for the ICSC P3 effort as well as for our clients. We live tweeted quite a bit, so follow us @cdavisor if you want to keep up. Here are some more pics for fun. 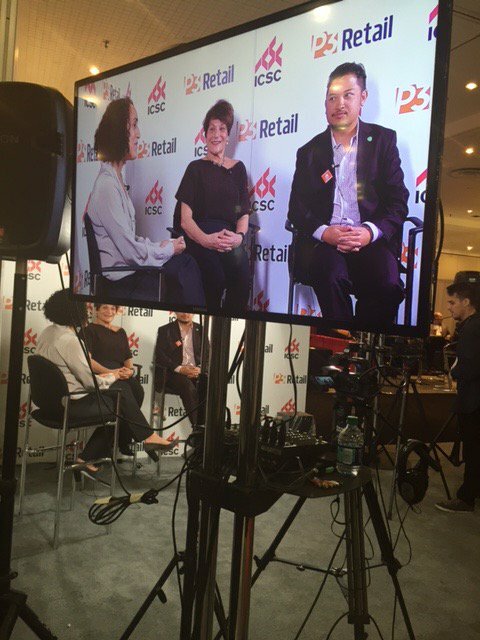 I felt like Oprah interviewing Mary Reda and Jim Diego at the #P3retail booth! Baltimore Downtown Partnership has a great location.